Thousands of supporters were welcomed by live mariachi music and were sent off with Selena’s music over the loudspeakers at a powerful kick-off for the presidential campaign of Texas son and former Obama HUD Secretary Julian Castro. In making his announcement, Castro listed a progressive platform which included Medicare for All, Green New Deal, fixing the immigration system (no wall and yes to family reunification), jobs creation, supporting early education and workforce education, justice/bail reform, and equality and equity. Offering the exact opposite of Trump and the Republicans, Castro set a high bar for the rest of the coming field of Democrats. As a Texas Mexican, along with many fellow Texas Mexicans, I can say we’ve been waiting a long time for a Chicano candidate with South Texas roots. Given his appointment to the Obama administration and his trajectory in politics, I didn’t know what to expect from his announcement, but I’m glad that, thus far, he seems to be running on his own platform and not one created for him by some moderate think tank. That said, there is no doubt he will have naysayers; however, those saying he’s too young/too inexperienced have now switched gears to finger pointing on one particular thing Castro was in charge of while he was running President Obama’s Department of Housing and Urban Development–dismissing a housing lawsuit against the City of Dallas. One must ask these particular naysayers, though: Where does the buck stop in the Obama administration? One other issue that will get some attention is where Castro lands on the issue of the PROMESA bill, which created a US-appointed and unelected oversight board for Puerto Rico, a process to restructure debt (bankruptcy) in Puerto Rico, and placed austerity measures on Puerto Rico, thus, cutting its public service budget. With the US in charge of this, public services could easily be privatized, while its budget would be reallocated to pay debt. After a destructive hurricane, the future of Puerto Rico is at stake, and those more interested in protecting creditors and creating wealth for millionaires, rather than protecting and serving the people, could only make things worse. NOTE: Lots of Democrats were on their way to Puerto Rico to discuss the latest on this, while also catching a show by PROMESA supporter, Lin-Manuel Miranda. I believe Julian Castro is included on the guest list and his brother, Congressman Joaquin Castro voted for PROMESA, despite opposition from the people of Puerto Rico and his colleague Congressman Luis Gutierrez (Puerto Rican). Offering up such a progressive campaign platform, Castro shouldn’t be promising great things for America, while sticking a fork in Puerto Rico’s future. I hope that Castro (both of them) will come to their senses on Puerto Rico and call for reform of PROMESA. Otherwise, Julian has the best platform I’ve seen from a candidate at this level in a long time. His speech delivery and the energy he received in return is something I hadn’t seen in a long time. I’ve been a fan of the Castros and I identify with their struggle, as do many Chicanos. For all candidates, though, if you run on struggle, it still must match up with policies. As attacks on Julian Castro will escalate, we will be hearing more about other 2020 prospects. Whether it’s Kamala Harris’ jailing of poor moms because of their kid’s truancy; Klobuchar’s selling out on border wall; Joe Biden being, well, Joe Biden; and the list will go on, Democrats will get to choose among candidates who have some bad marks. I just want to say ahead of time that criticism should not be thrown only at Julian Castro. 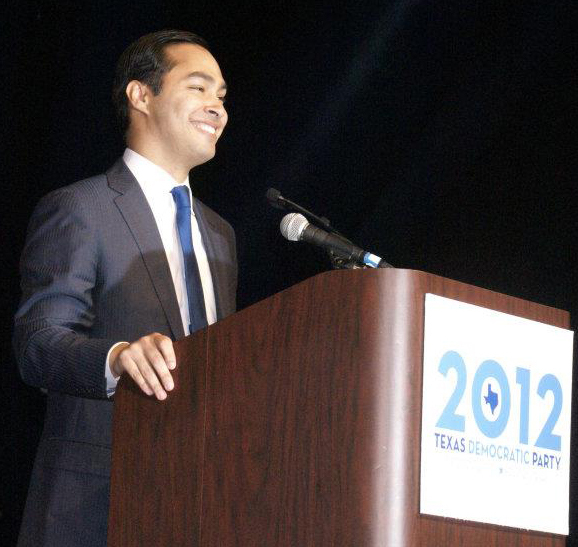 Thus far, given the names announced and talked about, and consideration of bad/good points of these prospects, Julian Castro remains at the top of my list. For Castro, wins in Nevada, California, and Texas would be huge, and my friends in those states are already excited about him. Still, 2019 is just as important and we must vote in local elections, too.